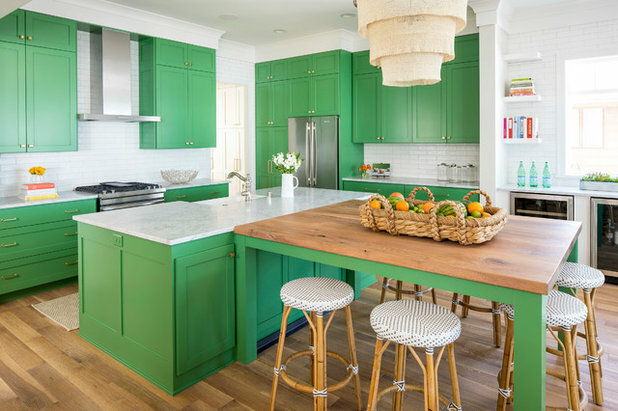 So you’ve decided on green for your kitchen cabinets. 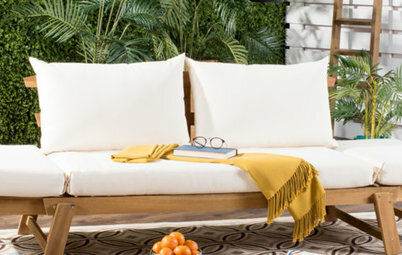 “Green is a great color to bring inside because it’s found everywhere in nature and plays well with other colors,” interior designer Sommer Tate says. 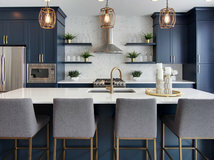 Now that you have cabinet color checked off your list, it’s time to figure out what will look best with it in terms of countertops, hardware, backsplashes and other finishes in the room. 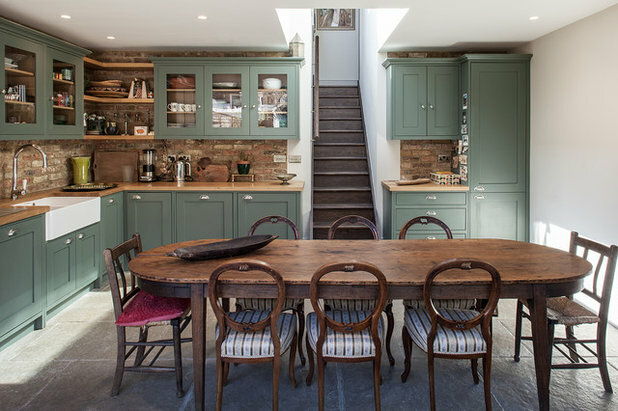 Here’s a look at nine beautiful kitchens in a range of styles that do green proud. Style. This 1905 Texas bungalow in Fort Worth’s Fairmount historic district had a cozily compact kitchen. 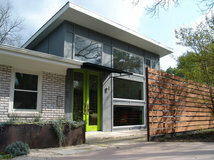 The pros at Urbanology Designs worked with a homeowner who wanted a vintage look, modern design and color. 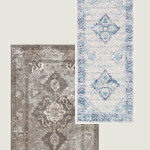 The resulting style is a little of your Grandma’s beloved kitchen, freshened up with modern touches. Why it works. 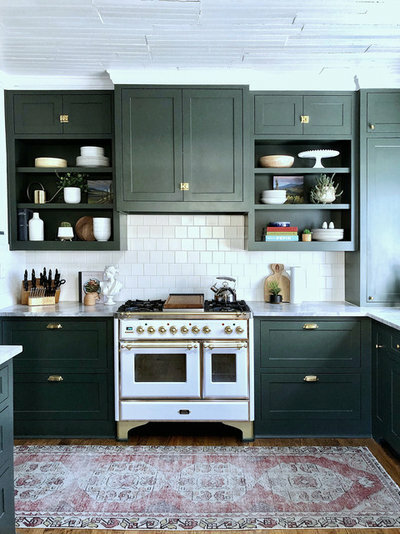 The cabinet color is Sherwin-Williams Foxhall Green, a nature-inspired evergreen hue that would have been common in a bungalow back in 1905. The Shaker-style cabinetry is classic and modern — inset profiles update the look while the bin pulls and latch hardware add vintage touches. 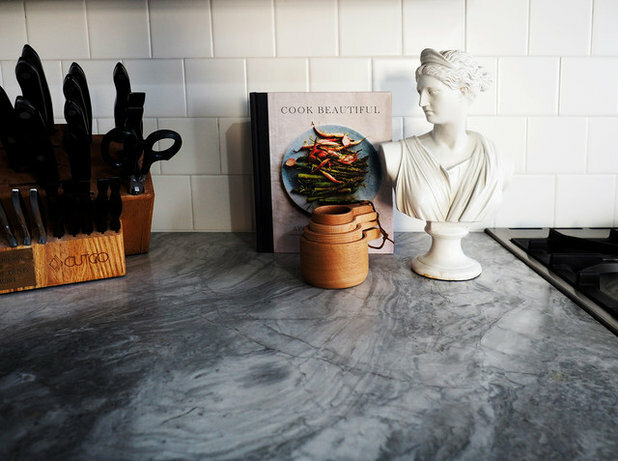 The countertops ride the same line — the veining patterns nod to traditional marble but the material is a newer option, quartz, and the squared-off edges are also modern. The 4-by-4-inch white tiles of the backsplash add Scandinavian modern simplicity. And while the enamel appliances match them, their style has retro appeal. 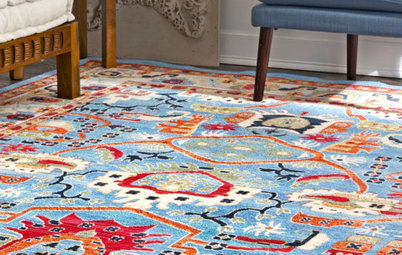 A timeless vintage Turkish rug brings in more color. Style. This home is on 3 acres in Dallas. “The owners wanted a nod to farmhouse style but also liked clean lines and color,” Sommer Tate of Folkway Design & Wares says. A blend of strong modern horizontal lines, rustic textures rendered in white and vintage touches results in a transitional style. Why it works. 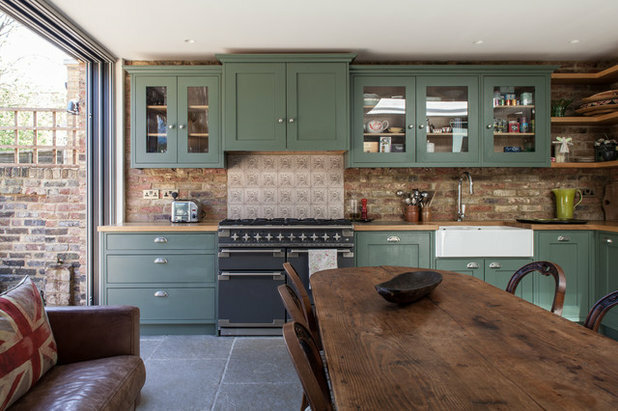 “We decided since the space was very open to the rest of the house we wanted to give the cabinets some visual weight by painting them a moody green,” Tate says. 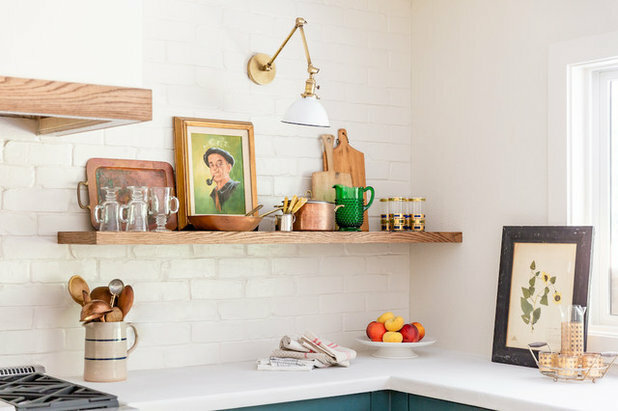 She balanced this by using white painted bricks for the backsplash and white concrete for the countertops — both are industrial textures brightened up by their white tones. The brass of the simple round knobs, long horizontal bar pulls and vintage-style library lights, as well as the wood accents, add warmth to the room. Style. The kitchen in this Victorian home in West London opens to the garden, and the thoughtful material choices connect indoors to out. Designed by Cayford Design and fabricated by Chris Rasmussen, the room is a mix of earthy materials and colors. 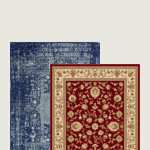 The result is a rustic-chic look that nods to tradition. Why it works. 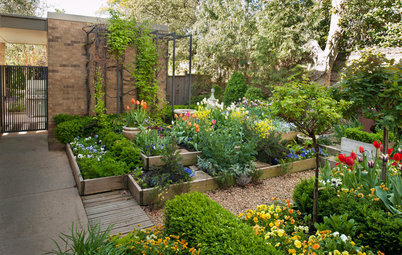 By plucking the cabinet color and other finishes straight from the garden, the designers made the kitchen a natural extension of the outdoors — the brick continues seamlessly from the outer wall onto the backsplash, the limestone slabs laid in a casual staggered pattern extend the patio feel inside, and the European oak of the countertops connects to the trees. 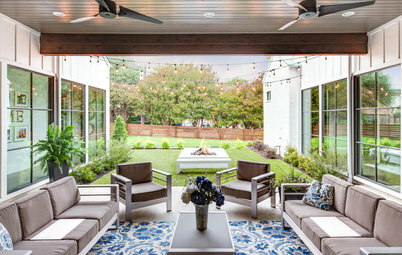 Elements like inset Shaker-style and slab cabinetry, glass doors, traditional pewter hardware and patterned range backsplash are more formal touches that balance the garden-inspired aspects. Style. This kitchen in Minnesota is a builder’s own home, crafted with help from Martha O’Hara Interiors. It has a relaxed and comfortable lake house vibe. The mix of traditional, rustic and more modern elements results in an eclectic look that’s cheerful and doesn’t take itself too seriously. Why it works. 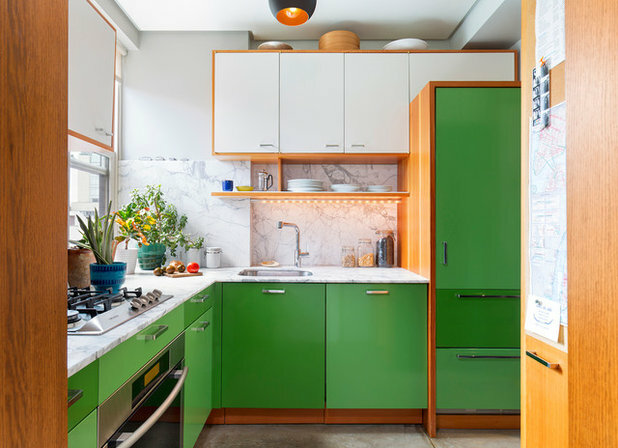 The energetic green on the Shaker-style and slab-front cabinets needed some balance. White Carrara marble countertops and white elongated porcelain backsplash tile give the eye a break. 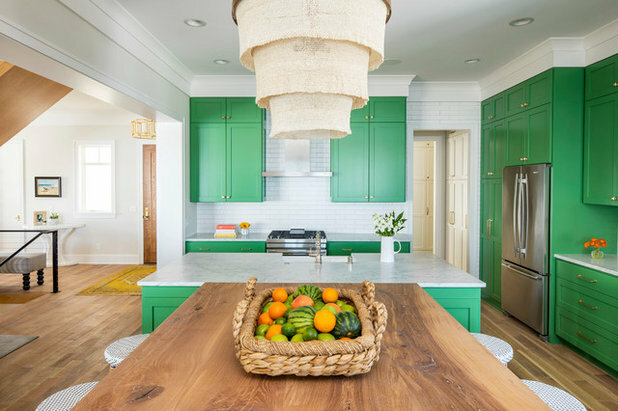 The designer added warmth and textural interest with an oak island countertop, shell chandelier and brass hardware. Using nickel on the faucets and stainless steel elsewhere added to the metallic mix. 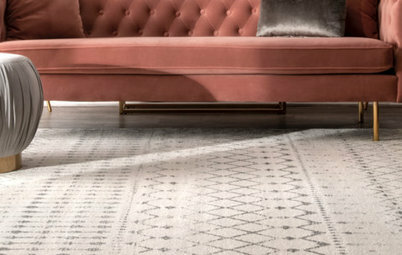 “I’ve embraced mixing metals lately because certain finishes will go on and off trend. 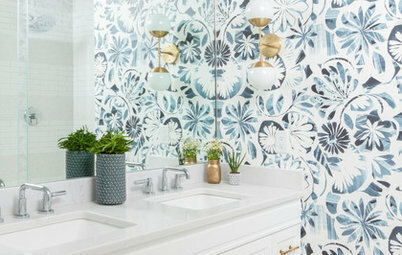 With mixing, you can just do what feels right and it makes it eclectic rather than trendy,” designer Rebecca Van’t Hull says. Style. The style is transitional. Crisp white on the countertops and backsplash, streamlined hardware and contemporary counter stools layer updated touches atop the classic elements in here. Why it works. 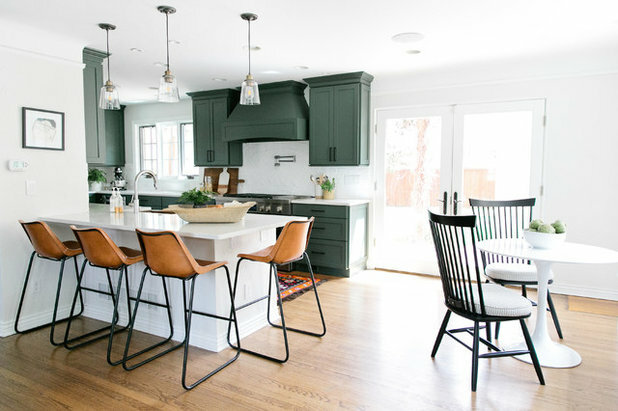 This kitchen in Colorado gets plenty of natural light, so it handles the medium green tone beautifully. Dunn-Edwards’ Midnight Spruce was a great paint choice for the Rocky Mountain locale. 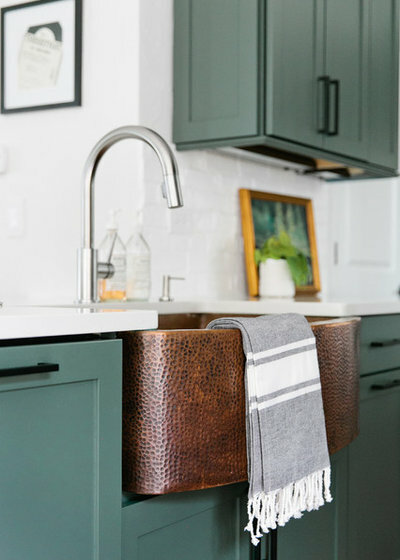 The white-painted brick backsplash and clean white quartz countertops allow accents like the hammered copper sink to stand out. Simple streamlined matte black hardware and the unfussy polished chrome faucet lend some modern contrast. Finally, leather counter stools and a vibrant rug add personality. Style. Clean lines and a playful color-blocked scheme create a warm modern vibe in this Manhattan apartment kitchen. Why it works. 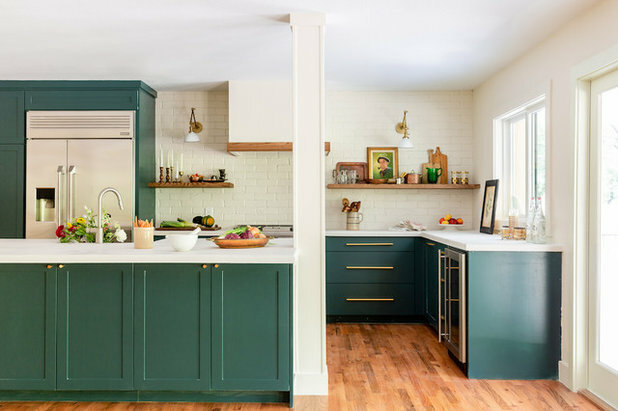 The cabinets are painted in two shades of green on alternating drawers and doors, for a subtle color-blocked effect, while white upper cabinets blend into the ceiling and make the room feel larger. 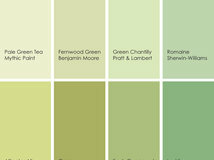 The two shades of green were custom mixed and are based on the colors of Castelvetrano olives. 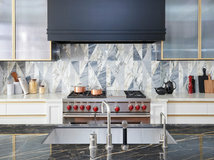 The marble counters and backsplash are elegant, and the pulls have modern profiles in a polished stainless steel finish. A distressed concrete floor and natural fir framing around the cabinets add contrast to the sleeker finishes in the room. Style. After this beautiful 1920s Mediterranean home in Minneapolis suffered a devastating fire, the architects of David Heide Design Studio and the pros at Dovetail Renovation helped the homeowners re-create its original style. 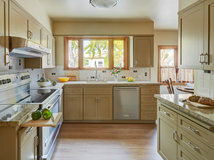 The new and improved larger kitchen captures the Mediterranean look that was popular during the 1920s. Why it works. 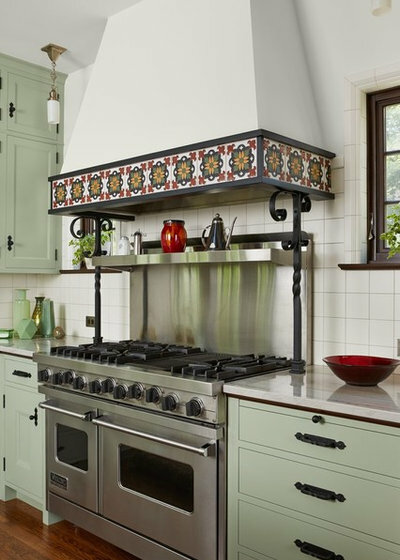 History drove this design, and the era-appropriate inset Shaker-style doors and slab drawers in pale green adorned by wrought iron hardware send us back in time. 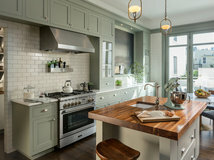 So do the square tiles of the backsplash, patterned accent tile details, polished nickel faucet, vintage-inspired light fixtures and mahogany. 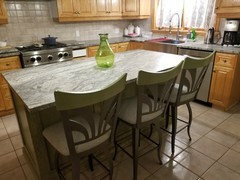 White Macaubas quartzite countertops pick up on the cabinet color via their soft gray and green veining. Style. 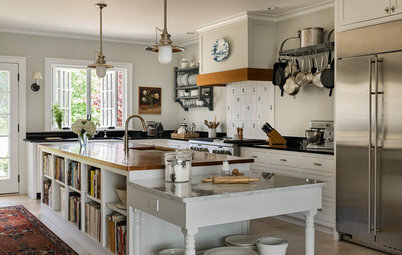 The idea behind this kitchen was 1950s diner appeal. 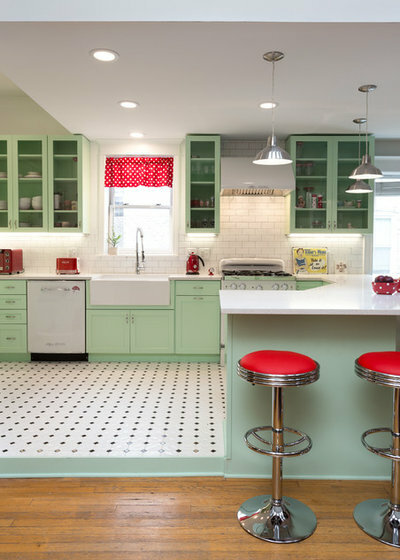 Designer Larry Lambert of Chi Renovation & Design helped his clients land on the right green to capture the retro feel. Why it works. 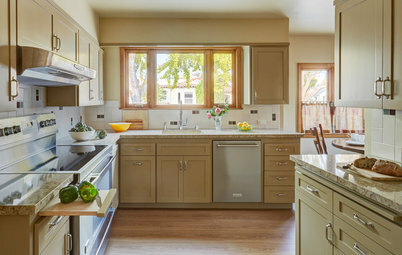 The cabinets are Shaker-style with glass doors on the uppers. Chrome hardware with 1950s silhouettes helps capture the nostalgic vibe the clients craved. 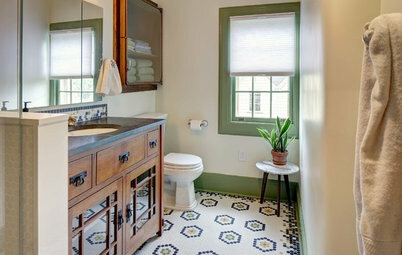 So do the black-and-white hexagonal floor tiles and chrome-and-red counter stools. The timeless white subway tile backsplash and white appliances keep the space bright and let the mint cabinetry and red accents stand out. Lambert used quartz for the countertops, making sure to select a style that fit the space’s ’50s aesthetic. 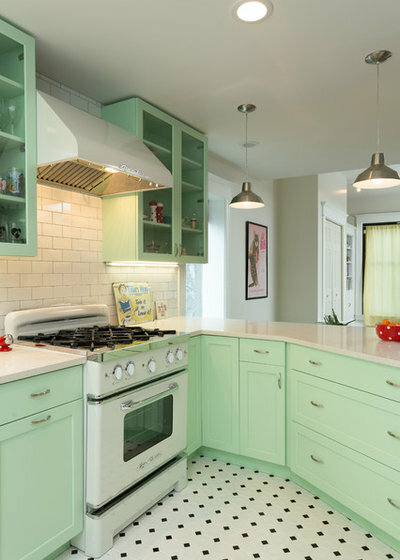 “It has some speckling in it and reflects the light well to give it that retro, sparkly look,” he told Houzz. Style. 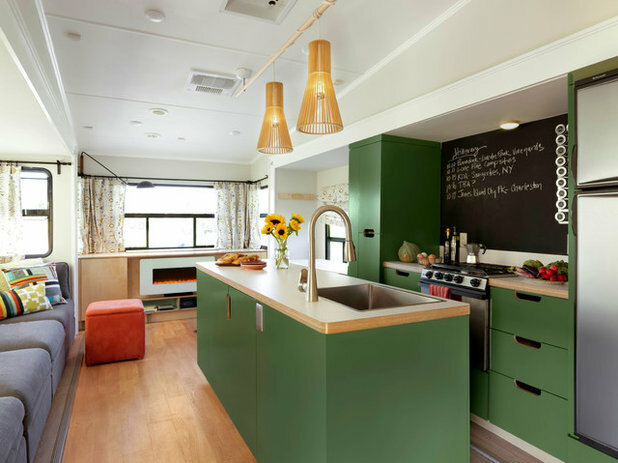 Interior designer Susan Small and her husband, certified project manager George Landis, outfitted this RV so they could work and live in it while traveling around the country to visit family and friends. 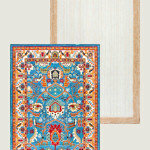 The style they chose was inspired by Scandinavian modern design. Cabinet style, color and hardware. Simple overlay slab-front cabinetry is a good choice in a small space — something more ornate would have overwhelmed the eye in here. 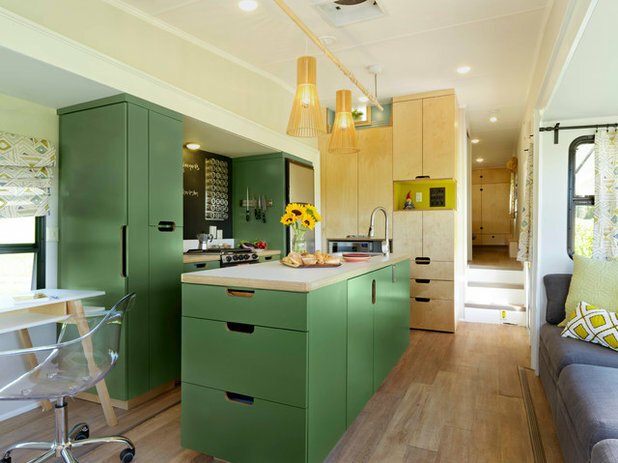 Because the RV is used for camping, the homeowners incorporated colors from nature, using a mossy green (Benjamin Moore’s Shady Lane) on the cabinets. Another wall of cabinets is natural birch. In lieu of hardware, the owners opted for cutout handles. Backsplash. The small backsplash area here is chalkboard, which adds depth and a place to scribble messages, shopping lists and recipes. Countertops. The simple laminate counters also have Scandinavian simplicity. 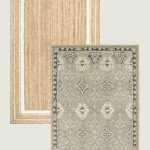 They’re edged in natural Baltic birch, which plays off the grass hue of the cabinets and adds warmth to the space. Other materials in the mix. 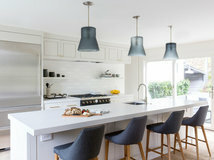 Pendant lights play off the birch cabinets and countertop edges. @hotscotgal, Yes, the stools are the same stain colour. 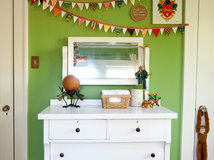 Pistachio is a lovely color and can be "lived with" for a long time. Not so with the other brighter greens. Greying some of the greens is very successful. Cabinets are an expensive part of a kitchen. Most people will tire of some of the brighter colors. Think twice about what you can live with long term. 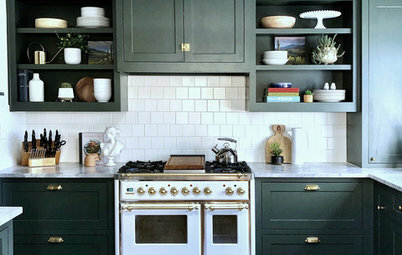 @rebecca Abraham Design - I've been living with my bright green and white cabinets for 4 years and I'm not getting tired of it. If you follow a trend for trends sake, then sure those types of people will likely get tired of bright green, but then again they'd probably get tired of any colour. Pick a colour you love and don't care whether it goes out of style and you'll still be happy with it. I also advocate for designing for your home's architecture so that you're not constantly chasing after trends for your large renovations (your kitchen cabinets, bathroom tile etc). If you have a craftsman, go for something in that style, have a MCM, design for MCM etc. I chose a bright avocado that works well with my 1960's home.I thought that when we get around to renovating the kitchen in 10 years that I'll want to go all wood (teak) but honestly I love the green so much that I'm not sure I could imagine having a kitchen without it or some other bright colour. I don't plan on selling ever so why not go for something I'd enjoy?